Alex J. Cavanaugh: Deja Vu Blogfest - A SyFy Classic! I watched this arse water a while back when I was unwell on SYFY, you described it a lot better than it viewed. Whew -- dodged a bullet there! I kinda wanna see the actor getting hammered, but after Harrison Ford's interviews for his news- anchor movie, I've had my fill of drunk actors. Start with a dumb premise. . .
. . .give it a dumb name. . .
. . .and what do you get? More than half the horror films ever made! It's tempting to watch it just to be able to giggle periodically while saying "Sharktopus." But then again, I suppose I can do that anyway. I'm so glad I didn't waste my time with that movie. Good luck with the rest of the contests, and congratulations. I heard they're making Part 2. Just kidding! Angry lurker, I had to do something to amuse myself during the movie! Sean, that's how it works. Sarah, don't torture yourself. My play-by-play is better! Marta, I'm surprised they haven't! Loved your re-cap and I SO don't need to see this now! And yes, what the heck IS a Sharktopus? Your play-by-play review of Sharktopus is just as hilarious as it was the first time around. I love it! LMAO I loved this post! Sharktopus is the aftermath of Mega Shark vs. Giant Octopus. Things got out of hand way out there in the deep. You know, I once live tweeted a dental visit, in retrospect, something like a movie would have been much better. That was great stuff. Great play by play.I've seen some dumb movies for sure. So on my Santa List!! LOL! A classic, indeed. The title alone is enough to set expectations at there lowest possible B grade. lol But it does make for a funny blog post!! oh my gosh, that movie sounds awesome... well cool, i mean neato, okay super... i know i love these types of films, this was a stretch. thanks for the shout out and our search for eillie, continues... not as stalkers, but as friends. have the best kind of day! ps. rush rules and your choice to write to it... rocks. we need to talk when you get the sector set... one friend to another. Sharktopus was next on my viewing queue so thanks for saving me from it. That along with Babeorama and Gorefest...thanks for the giggle. Thanks, I just snorted my coffee. You are amusing Alex :-). I would've given up after 10 mins lol. ROFL - that Sharkopus was awesome. "Not so attractive woman goes bungee jumping. I’m okay with her dying. " But you hit Kevin Costner accent issue perfectly! I've been worried about Ellie too. I keep dropping by her blog to see if she's updated it. My first several laughs of the morn. Thanks, Alex. You really need to keep working the humor angle - you're good, subtle and biting at the same time. Oh, and I find myself growing nostalgic for a guy in a rubber piece too. I love it when some one can make me cry or laugh out loud. You accomplished one and almost the other (because I was laughing so hard). You win. Hilarious. Voted for you and the fantabulous Nebular. Hope you guys come out on top. With reviews like this you outta. Wow! Never heard of that one, but if it's as bad, or worse, than you described....Yikes! Very funny stuff, Alex. And BTW, I e-mailed Ellie about a month ago....No reply. I AM concerned about her, too. Please let me know if you find out anything. George, it even made me chuckle again. Here's hoping for a big win for everyone this weekend. PK, that's why I chose this one. Thanks, Jeremy. We do need to talk Rush some day. Eve, it was a sacrifice I made for my blogger buddies! Donna, I know - shallow. But I was getting desperate at that point. Robyn, I'll try to infuse more snark into my posts for you. I don't know Ellie Garrett, but I hope all is well. Hehehe...42 minutes and 73 minutes are especially spectacular. alex, you are braver than I for watching this one. Nicki, it's because they are true! hah! I remember the sharktopus play by play. Good times. good times. And no, i haven't seen Ellie Garrett around. I also haven't seen Erica Spickard either, even though i left her a note. I hope they're both OK. I'm glad I missed that one, but great re-cap. Congrats on your best writing blog award! Your recap of the movie was excellent. And funnier than the movie, I'm sure. Once, in a quest for free shipping from Amazon, I had to find one more cheap purchase. Somehow, Giant Shark vs. Mega Octopus ended in the cart. Please do yourself a favor and find the trailer on YouTube. Classic Debbie--excuse me, DEBORAH--Gibson and Lorenzo Lamas. There's a reason the trailer has 3.7 MILLION views. It's just that bad. I still haven't seen Sharktopus, but I've read your play by play twice. It's a classic blog post. Like Ellie, there are a few bloggers that I've wondered about and sent emails to that went unanswered. Hope they're all okay. Well ... very interesting ... ?? No, there is not enough alcohol in my house to get me through a movie like that. Wow. I have a feeling your hilarious commentary is all I will ever know of Sharktopus. Have a great weekend. I'm going to see the new Sherlock Holmes movie. Should be good. Too funny, Alex. I don't know how my hubby missed this one, he catches every other SyFy stinker. One of the best of your posts, for sure! You have to do more play by plays on other craptastic movies! Thanks so much for participating in the Blogfest! Too funny, Alex on your Sharktopus play by play. You made me giggle. I haven't heard from Ellie in quite some time. I just assumed she was on a blog break. But if you sent her an email and she did not respond...that doesn't bode well. congrats again! of course you're the best! and 122 minutes! how did you stand that insanity so long? You just saved me a couple of precious hours, because I was DYING to watch this! (Just kidding) Hilarious recap, Alex. Haha love the breakdown! This sounds like the worst movie ever. I laughed out loud (lol!) at min. 44. Poor Kevin. Sounds like one for the Mystery Science Theater 3000 chaps! Ah, the classics. These sorts of films are best seen in trailer form, I feel. I was really looking forward to this one. You know how much I love bad movies. Great play-by-play man. I watched Sharktopus a few months back and, yep, that's pretty much how I remember it going too! I haven't seen this movie but this play by play is hilarious. I have a feeling your play-by-play could gross more at the box office than the move itself. And yes, I'm still wondering what the hell a Sharktopus is...or even how to say it right. Lol, this is funny, man. The thoughts while watching Sharktopus. Eric Roberts has been in some really bad movies. Having watched Sharktopus (you tempted my curiosity months ago), I can say that you summed it up well, Alex! Thank you for saving me from the perils of Sharktopus. I can't pay you enough! Though I will admit I first thought you were talking about Sharkboy & Lava Girl which I WISH I had paid someone to save me from. I think this should be a routine thing for you. Because I actually would consider watching this piece of craptacular cinema thanks to your play-by-play. Eric Roberts should thank you. Helen, MUCH funnier than the movie! LG, if the alcohol put you to sleep, you might be all right. Thanks, DL! And thanks for hosting the blogfest. Thanks, Michael. I knew she was taking a break, but not this long, and she hasn't responded to emails or Tweets. Tara, it was a sacrifice for my blogging buddies. Man O Clay, they were my inspiration. Angela, I should do my own movie! Julie, he should send cash as well. There are movies that never made a blip on my radar. Dare I say, this be one of them. I am so unintrigued by the premise of this movie, that I find myself needing to see it with mine own eyes. But, maybe not. Your critique of it seems accurate enough. Thank you. They should redo the old SNL skit and have Land Sharktopus! Hahahaha - thank you for saving me the two hours! Oh Syfy, how you will never cease to amaze me with your wonderfully rotten movies. I hope they never stop. Maybe I can write a script for them one day! You should think about regularly riffing on Syfy movies, Alex. I'd be there reading the posts! Christine, I do need to do another one soon. #64 had me laughing out loud! Alex, dude, how've you been? I just voted for you. You're winning in both categories, but only by 2% for the first one, so I hope more people get over there to vote for you! This post is hilarious! Great job. I'll be sure to pass on this movie. This blog hop is great. I joined it because the one you and Matthew hosted was awesome. Take care! Loved reading your re-post, had a good laugh which is good for one's health. I hope Ellie is all right. Lyn, thanks for voting! And glad you joined the blogfest. Mary, can I do the play-by-play? I had not idea this movie even existed. Now I want to see it while reading your annotation and adding my snarky own. lol! Thank you for saving me the two hours. Great post! Glad I didn't miss it. Wow, I do hope Ellie is all right. I found out a few months ago that a critique partner I had died. How sad I was. I never met him but we have communicated so often that I felt a great loss. Let us know if you hear from Ellie, all right? Bit concerned about Ellie Garret. Let us know if she responds soon. Hilarious post Alex. There are movies like that unfortunately. Nothing like this movie but I saw Ides of March last night and was so disappointed. Even with George Clooney's captivating facial features. A really, really, American movie for sure. Oh God, that was one of the funniest posts I've ever read! I'm crying from laughing so hard. You picked a great one to repost, Alex. Thanks for re-sharing it!! Absolutely loved it! And congrats on your tie with Jenny Hillier! That vote was a hard one for me. I love, love, love your blog, so of course I voted for you, but Jenny is a good friend, so I voted for her, too. We're going out to dinner this Sunday so I can say goodbye before she returns to Canada. I'll make sure we say a toast in your honor! Helena, please do! We could rewrite all the dialogue as well. Clarissa, that is terrible! I'm sorry. Really hope we hear from Ellie. Nancy, glad I could make you laugh. And you're good friends with Jennifer? She is really nice. Found out we just downloaded each other's books! I haven't heard from Ellie in a while either - hope all is well! 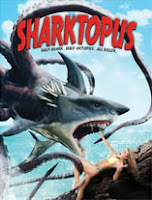 Sharktopus...ummm-mmm, I thought I saw that playing at the adult theater. You sure you got the right version? Oh my GAWD so FUNNY! I haven't been unfortunate enough to see this movie, but somehow I'm certain your play-by-play is way better! Why would you even watch something that was called "Sharktopus"??! Love your comments on the film and sooo pleased I don't have the watch it. Seen enough bad movies in my time. Jemi, I'm worried about her. Lost, if there's one better, let me know. Jennifer, I promise it is better! Claire, it was a sacrifice for my blogger buddies. Loved the play by play--ha! You're a brave man to have invested some of those precious Life Lottery winnings on this puppy! Ahh...good thing there's always tomorrow (here's hoping anyway)! Thanks for saving me two hours - that definitely doesn't sound like my sort of thing. Hi Alex - I have trouble getting through to your blog - and had wanted to say I've emailed Madeleine re Ellie .. we'll let you know ..
Sharktopus sounds like an awfully bad film, yet now I want to see it. I'm sure I'll turn it off after a few minutes, but you've piqued my interest. How on earth did you sit through that film? I think I'd have been heading for the alcohol too, and I'm tee-total! Your comments were great, though - so funny. Thanks for re-posting this. I might not have to waste two hours of my life on it, but since my younger brother loves this kind of thing, I'm almost certainly going to end up doing it anyway. Ella, thanks. I liked it a little better. Lighter with more humor. Jennie, I don't like it either. Last year, Cassandra Jade vanished in the middle of her book tour and no one's heard from her since. It's sad. Sorry you had trouble, Hilary. Got your email and hope we hear from Ellie. Stu, at least you know what you're getting into. I remember this post! True story: we're in Walmart a couple weeks ago and my youngest pulls Sharktpous off the shelf and asks me what this movie was about. I thought back to this blog and had a great laugh. I'm off to cast my vote for you now. Good luck! Awesome minute-by-minute movie summary. I am still laughing! I just checked and you are at 40% in the Best Post category (Let's Get Out Of Here is at 43%) and you are in a lead (72%) at the Best Sci-Fi category. Woot woot! hahaha I've wasted plenty of time watching craptastic movies, which make good coffee table coasters after your through with them by the way. But never came across this one, thankfully. Oh.My.Gawd. The Sharktopus review is hilarious. Bravo, Alex! I'm embarassed to say that I too watched this one. I'm a sucker for cheesy SyFy. Stephen, and hopefully told him to put it right back on the shelf. Thanks, Angela. Think I'm going to lose Best post though. Liz, glad you enjoyed it! Very good it of thoughts. Have you registered with a recorder? Leovi, not one needs to hear me speak. Suze! I was okay with the ugly guys dying as well. LOL, thank you for saving my money. I can go buy some good sci-fi books instead. I love your thought of not waste time arguing. I think that's make a big advance on the film. You have just made my night. Total new fan of the play by play. You're freaking hysterical! LOL. I remember that post! No, I haven't heard from Ellie. :( I miss her--hope she responds soon! Enid, definitely save your money! Golden, I am worried about her. This film sounds hilariously bad. BTW, am a new follower, and I just bought your CassaStar for kindle. Looking forward to reading it! Never heard of that movie, but your play-by-play was hilarious! My husband hates Kevin Costner's Robin Hood, so we got a chuckle out of that. This blow-by-blow shows bravery and perseverance above & beyond! With this kind of selfless devotion and strong stomach, in another century I could quite see you earning a living as the royal food taster. Hope Ellie's OK. Like others here, I've stopped by her blog in recent weeks and seen it was unusually quiet. LOL! Never heard of Sharktopus (a TWO hour film at that! ), but looks like I've not missed much! :) Awesome re-post! I'll be back for your Debutante offering! Heh. The last movie we trashed was Knight and Day. As for Robin Hood, why can't people in this genre at least TRY to act the part? I'm guessing that there are many 'actors' who CAN'T. Cindy, hope you get to see it. Alexia, glad I gave him a chuckle. Botanist, thank you. I have a new aspiration now! Heidi, you'd have a field day with this one. Ha! Love this play by play. There's a couple other movies I wish you'd have saved me from. Oh well. can't wait to get on the a to z challenge with you guys!